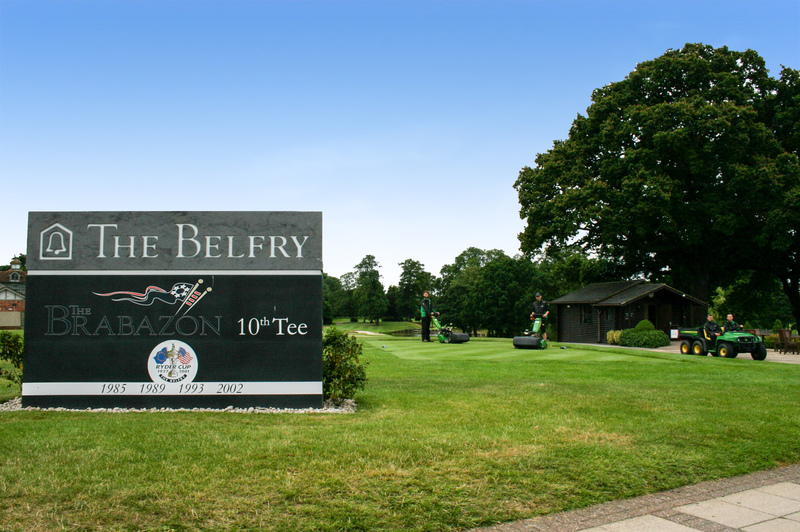 Only one golf course in the world can boast that it’s hosted more Ryder Cup matches than any other venue – and that’s The Belfry Hotel & Resort in North Warwickshire. The 550-acre site is a mecca for professional and amateur players who come to play on one or more of its three stunning courses – and The Brabazon, Derby and PGA National have witnessed some of the most dramatic moments in the history of golf. So what is the secret recipe? Take the finest staff, a top quality course manager and industry leading golf course maintenance equipment backed by a first class dealer, and you can start to see why The Belfry is world famous. Director of golf courses and estates Angus Macleod arrived from De Vere Belton Woods in 2012, and with courses head greenkeeper Jamie Brooks oversees a summer team of over 50 greenkeeping staff. 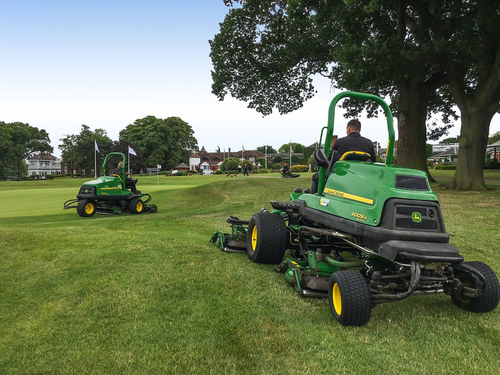 He is also behind the recent purchase of a new fleet of grass cutting and ancillary equipment from local John Deere dealer Farol Ltd at Hinckley, Leicestershire – a return to the brand after Deere was official supplier to the 2002 Ryder Cup matches. The new John Deere machines include five 260SL walk-behind greens mowers, two 2500E hybrid electric greens triple mowers, a 7200A PrecisionCut tees & surrounds mower, a 9009A rotary rough mower and a 2030A Pro Gator utility vehicle equipped with an HD200 low-profile amenity turf sprayer. “When I arrived we were experiencing the usual problems associated with an ageing machinery fleet, particularly the increasingly high cost of parts,” says Angus. “The owners KSL gave me a budget and we agreed on a phased replacement deal over several years, starting with the mowers. “The process began with demonstrations by the leading manufacturers and a chance for all the staff to try the machines and give me their feedback. It was an important decision and a huge investment, so making sure the staff are happy with the equipment they use is my number one priority. Whatever decision we make, it is as a team. “There will always be issues of one kind or another with machinery, so a priority is always how are they rectified, and what do the supplying dealer and manufacturer do about it? Dealer service, parts back-up and warranty support are as important as reliability – it’s certainly not just about the price. Then we look at the technology, with an emphasis on cutting quality – I have to be comfortable with the quality of cut and course presentation overall. Matt Gilks in particular making a big impression on the team. “The new 9009A is an absolutely superb bit of kit, and the boys love it,” says Angus. “It has great climbing ability, it can follow the course’s turf contours better than previous machines and goes places we couldn’t go before. I like the rear roller on the cutting units and the consistency of cut. “The cut quality and offset wheels on the 2500E hybrid greens mower are also a very good feature. Used alongside our existing TE electric Gators, particularly to maintain the areas around the hotel, means early starts are no problem as the machines are so quiet. In addition, the TechControl system on the new A Model mowers means we can set up these machines and keep them operating consistently across all three courses, so cut quality isn’t compromised. Both Angus Macleod and Jamie Brooks also agree on the importance of establishing a good working relationship with the local dealer. “We’ve been really impressed with the support Farol has given us so far, including very comprehensive operator training, and this was another one of the main reasons that we leant towards John Deere in the final reckoning,” says Angus.